Recovering Working Mom: Where's your green marker?! Mine is in the principal’s office at my children’s school. Got another one of those “Dear Mrs. Dugdale” letters today. This was the second one in THREE DAYS! The Id (the baby) is killing me! This time she lost her bathroom privileges during class time because without permission she left the classroom with a contraband green marker and colored her eyelids and lips with the green marker. Apparently this is not the first time she has done this, and the straw that broke the camel’s back for the teacher is that when asked if she had put marker on her face, she told the teacher from her green markered lips “no”! This is what we call a “human potato chip” moment. The Id is blonde, and I’m sorry to admit that those roots go deep in that little brain! Now I have to admit that I am pretty sure this was my fault. I allowed the Id to watch Glee the other night and during the show they had on every beauty commercial known to man – no body part was spared an advertisement about how to make it prettier or silkier or just plain better. 1) NEVER, EVER, EVER watch Glee with a five year old who is obsessed with make-up. Other than the obvious judgment that people might pass on you for allowing a five year old to watch a rather risqué show, your child MAY completely turn on you and mid-show say “mommy, you need some new cream for your face. I mean, I love you and you are pretty, but you have those pimple things that make your face all red”. At the next commercial break she may follow this up with “mommy, you need some of that Tresseme shampoo because your hair needs to be shinier”. Are you f*&#ing kidding me?! I am now subjected to beauty advice from my five year old who thinks that Crayola is the way to true beauty?! The next Cover Girl, right here!!!! Ok, this was from an earlier marker incident. Do we see a pattern here? Who keeps stocking the house with those markers?!!! 2) You may think that being sent to the principal’s office is a terrible thing, but when your child (who is actually the second of your children to be in the principal’s office in as many weeks) goes to the principal’s office you MAY find that the principal actually has a sense of humor. After your principal has had the very serious talk with your child about trustworthiness and not putting markers that are “disgusting” (the Id’s word, not hers) in your eyes, she will then ask the child to leave and to close the door; at that point you and the principal may laugh so hard you cry because she has to compliment your child on her make-up application techniques. I’m not kidding you, that child had her “marker make-up” applied perfectly on her eyelids. I was such a proud momma at that point. 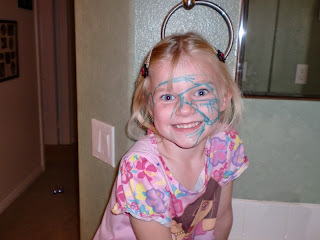 Moral for today – IF your child is going to apply “marker make-up”, please be sure that you have first taught her the proper eye make-up application techniques. Oh, and make sure you remind her not to interrupt class time to practice! Oh my goodness that is hysterical!!! I was laughing all the way through! I so know what you mean about Glee, I watch it too with my daughter (although she's a bit older) Thanks for a fun post! Glad you liked it, Lisa. Thanks for stopping by and laughing with me! I love the 7 motherhood lessons. New GFC follower from make my morning hop. Thanks, Shannon. The truth is always funnier, don't you think? It's always nice to know others feel my pain :) Thanks for the kind feedback, Kelly, and welcome! All I can say is I'm glad I have a boy! Your daughter is adorable, especially with her "marker makeup". New follower from Make my Morning Blog Hop.